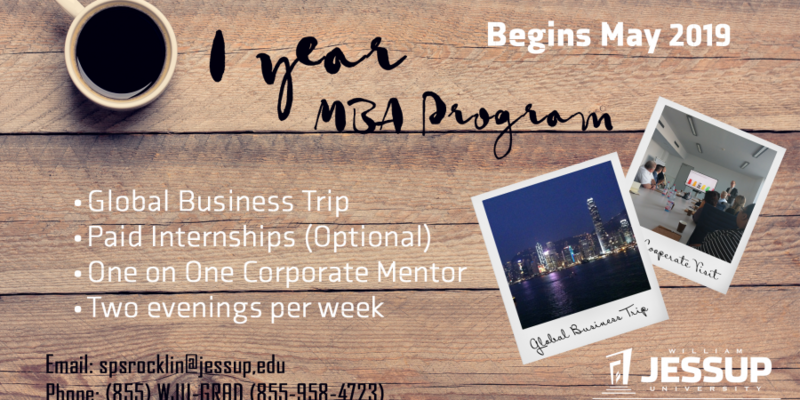 The WJU 1 Year MBA equips graduates to be highly-competent, principled and innovative leaders in business and society. The 1 Year MBA curriculum is relevant, quantitative and applicable for servant-leaders in both for-profit and non-profit organizations (churches, para-church ministries, healthcare and government organizations); the ethical framework integrated throughout the curriculum makes the WJU MBA distinct and different on purpose. The substantive and vital management skills of planning, controlling, decision making and organizational leadership are developed and strategically applied throughout the program; moreover, MBA students are challenged within a dynamic experiential learning environment to be effective transformational leaders with a global perspective. Spiritual Life Credit Forms Due! Experience the Bible Abroad with “Biblical Journeys”! It’s time to complete your 2019-2020 FAFSA!